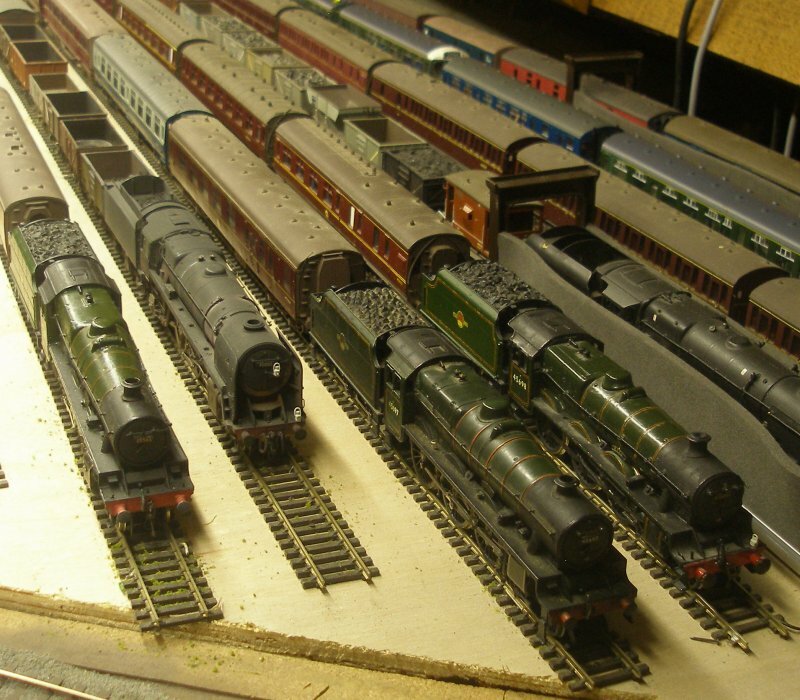 There is a need to build-up a fleet of heavy haulers for Hall Royd Junction, as some of the trains when made-up to their prototype configurations are too heavy for the Ready-to-Run loco fleet. One such train is the 10.0 am Liverpool Exchange to Newcastle which loads to 9 vehicles in the winter, which was regularly pulled by Bank Hall Jubilee 'Mars' or unnamed Patriot 45507. 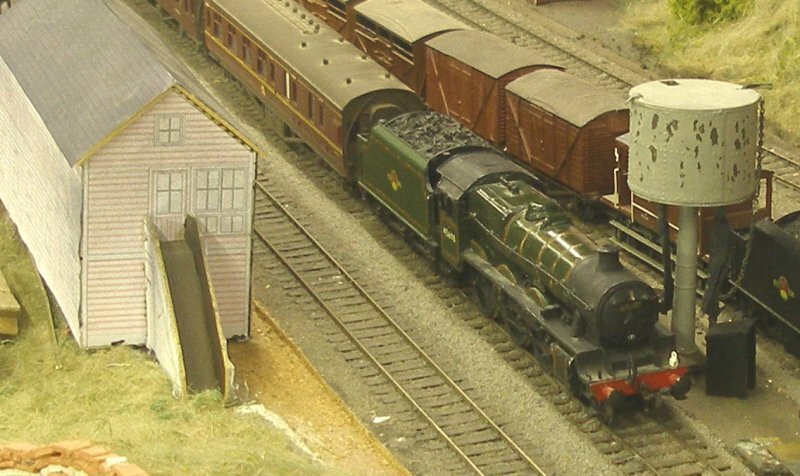 The Bachmann 'Patriot' is a beautifully executed model but is too light to handle 9 or even 10 kit built carriages. In February 2016 a Keyser (K's) assembled Jubilee body, chassis and tender were auctioned on eBay as a dismantled loco. The loco body (£13.55) and chassis (£18.50) were acquired. This left the thorny problem of the wheels. The Jubilee has 6' 9" driving wheels that scale out at 27mm. However this made for tight clearances due to the oversized flanges used in OO, and trying a spare set of 27mm wheels that were to hand suggested these were not going to work. A return to eBay found a set of 6 x 26mm wheels for £14.50. It was not until they arrived that I realised that the three insulated wheels were not drilled for the crank pins. This suggests that these are relatively old, as Romford/Markits wheels have been drilled and tapped for crank pins for at least 20+ years! I decided a two-stage approach was required, and first drilled a hole using a 1mm bit. The second pass was with a 1.5mm bit. The resulting hole was big enough to allow the modern Romford crank pins to be screwed it without any tapping. To ensure they did not work loose, they were secured with Loctite's Superglue gel. It was then possible to assemble the chassis. I had a spare Portescap RG4 which completed the job. It was unclear how the front coupling was intended to work and this was removed. The break blocks were inbound of the wheel flanges (! ), rather than being aligned with the wheel tread. They were also poorly aligned, with two blocks being some distance from the wheel they related to. As they were also causing a short with the 26mm wheels they were removed. The positioning of these suggest that the loco had originally been fitted with 25mm diameter wheels. With loco re-assembled, its first run revealed a number of issues with the bogie. The primary problem was a short circuit which proved difficult to track down - removing the bogie the loco ran well. So it was replaced with a spare Hornby bogie with the wheels changed over. This worked perfectly, so the original bogie has been popped in the spares box. The pick-ups were formed from rather stiff wire, and these were replaced with new ones made from 0.33 mm Gibson straight wire. Three weeks on the chassis is a runner, a decoder has been hardwired in, and some test trains have been run. K's Jubilee 45698 'Mars' is caught with the 10.0 am Liverpool Exchange - Newcastle restaurant express as it passes Hall Royd Junction sometime in late 1961. The loco survived a few more years, but it is not known when the original Fowler tender was swapped for the later Stanier type. Journey's end! From left to right are 'Victoria' with a Saturday excursion for Blackpool; 'Britannia' on her last revenue earning run in 1966 from Moston to Healey Mills; 'Bellerphron' also on a Blackpool excursion; and 'Mars' that has just arrived with the 10.0 am to Newcastle. On the far right is a 9F recently retired from running the Red Bank newspaper vans on its own, as the purchase of a NEC Powercab has meant that consisting can be now be set-up very easily, and the 9F has been replaced by a pair of Black 5s rather as happened on the prototype. For those interested in such things, the 9F was built and displayed by the Mevagissey Model Railway for many years, and which is where I first saw it! Another steal from eBay. For those who claim they never have problems with DCC, the operation of 'Mars' as she ran into the storage yard was of note. The last few feet are normally covered with rolling stock so are difficult/irregularly cleaned. As 'Mars' ran up the siding she suddenly reversed direction. This seems unique to this loco, but now realise it occurs on dirty track. CV29 is set to allow DC operation and I suspect that the loco is losing the command link and so is reverting to DC operation (the default). As the chip is hardwired the wrong way round, I corrected CV29 accordingly. Consequently the default is backwards! To stop this happening I either have to keep the rails cleaner or disable DC operation.